Deputies nab meth suspects after earlier traffic stop in Galveston Co.
GALVESTON COUNTY, TX (KTRK) -- Two men accused of making meth in Galveston County nearly got away after allowing a woman to take the fall during a traffic stop. 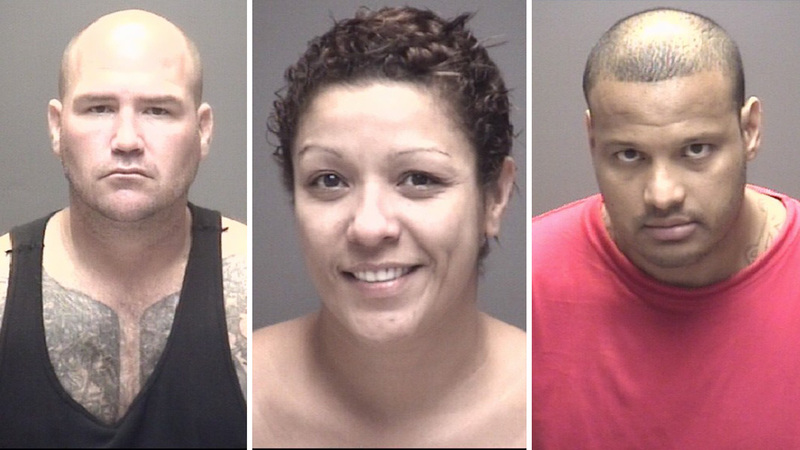 Galveston County Sheriff's deputies stopped three people inside a vehicle in the 200 block of 27th Street in San Leon on Tuesday. During the stop, deputies found a handbag with a pistol and 9.2 grams of methamphetamine inside. Jaci Toy Faye, 34, allegedly claimed ownership of the bag and was taken into custody. Deputies say Faye is a convicted felon, so possession of a handgun is against the law. More than $2,700 in cash was also found, believed to be the profits from the sales of narcotics. The two men who were with Faye, Steven Russel Camp, 42, and Bernard Welch, Jr., 34, were then allowed to leave the scene. A short time later, deputies received a tip that Camp and Welch had returned to the scene of the traffic stop where they allegedly picked up a small package they had hid from deputies. Deputies say they found the men at a trailer park nearby with a cell phone box containing 10.2 ounces of methamphetamine. Camp and Welch were arrested and charged with manufacturing and delivering a controlled substance. They are both being held on a $250,000 bond. Faye, meantime, was charged with unlawful possession of a firearm and the manufacturing and delivery of a controlled substance. Her bond was set at $300,000.